We have found through reading, that mills have been made in many sizes over the years, all the way up to 3-1/2 cells to the inch. THIS IS WHERE OUR INDUSTRY HAS GOTTEN INTO SO MUCH TROUBLE. CELL SIZES, THEIR SIZE, AND HOW TO MEASURE THEM. 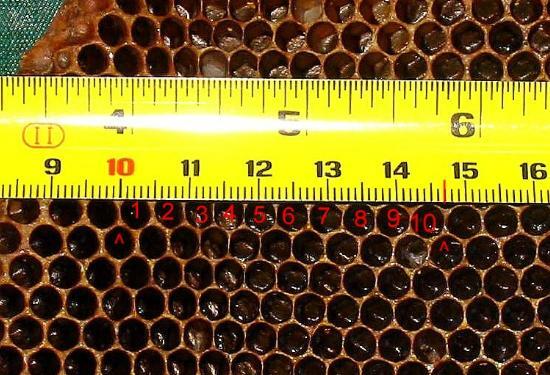 Most beekeepers universally agree that five cells to the inch is worker size and four cells to the inch is drone size in the feral population. But, the domestic sizes our bees today have ended up on, are quite different and have wrought havoc, as artificial combs have gotten bigger. The stress upon our honeybees caused by being out-of-balance with natural flora has opened Pandora’s box to foulbrood diseases, chalk, and viral infections. By being too big, our domesticated honeybees have taken on parasitic mite infestations as our now pseudo-drones, aka: worker bees, are perceived as a new food source by both Varroa and Tracheal mites. With all this damage being done, we find no teaching anywhere on the history of use of artificial comb foundation sizes in the USA, so our beekeepers can make rational decisions concerning proper usage. The various comb cell sizes (706, 711, standard, drone, etc) were originally designed with meaning, which is now forgotten in today’s modern world. No one person or company is to blame in the USA or elsewhere in our world for artificially increasing honeybees so big as to cause disease and parasitic mite problems that now encompass over 135 nations at catastrophic level, placing them in a situation out-of-tune with the reality of Nature. Nothing was hidden and everything was written and published out in the open. The only thing that has happened is that artificial supposition and an artificial domesticated system of beekeeping has so far prevailed over that found naturally occurring in Nature and has been taught. It began with a simple idea everyone wanted to participate in, i.e. scientists, manufacturing houses. Now through the passing of each successive generation (figure 20 years to each new generation), the growing disparity of size between feral and domestic hives dictates this bigger-is-better trend must be corrected and its underlying causative effects must be brought to light and taught, if beekeeping as we know it is to continue. Remember the time frame we went over previously for a proposed magnificent final: “The need to rear bees of extraordinary vigor, able to forage over a more extended flight-radius and to visit a multitude of flowers the nectar of which was then and still is today, out-of-reach of their tongues? In actuality, the need for selection to breed a better bee. HAVE WE REALLY SUCCEEDED? Hindsight would say no. But one must admit, everyone tried hard to do so. We had a great “Roaring 20s”, even fought a War. We learned a lot this century, but at what price? We all strived in every nation to breed bigger livestock, bigger and better plants for food, a better human race, we vanquished diseases with various treatments, we have practically redesigned the world, and lastly, we have now gone to the heavens. But as everything goes full circle in the end in evolution, if it is not right, the real question is: Will it last and stand the test of time eternal? I do not think so. Much is already collapsing or has already collapsed. Antibiotics are playing out, and inbred plants and animals are naturally retrogressing in spite of man’s attempts to prevent otherwise. We have learned the hard way this century that there is no superior race of man. 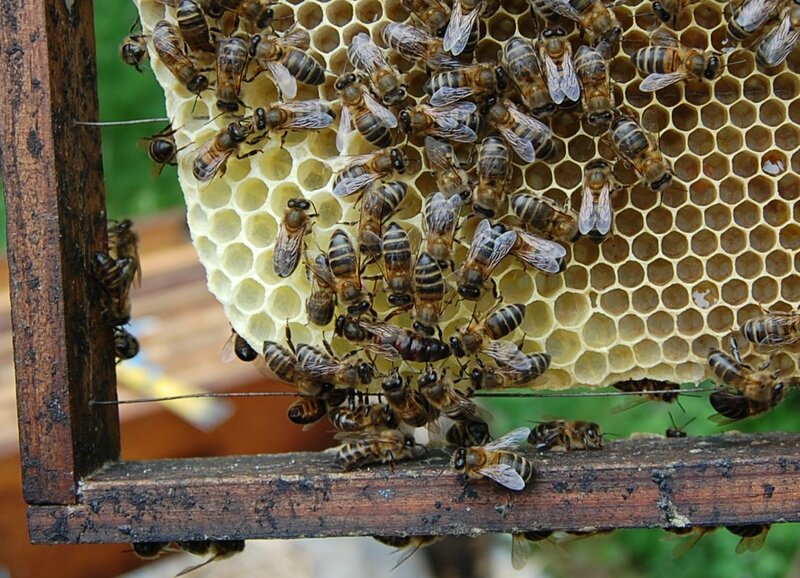 Why should beekeeping be any different? It’s not except for one thing: most beekeepers in the field are not schooled on the history of what transpired concerning the artificial mutation of making our honeybees bigger. Why? Was it not explained to them through various journals and publications? Explained it was, but not all at once, nor in the same journal, so someone could learn through continuous reading. The information seems to have been scattered, a trait common even today in the publishing of scientific information or any information technically, for that matter. The question now seems to be, how does a worldwide industry put honeybees that are artificially oversized back in tune, locality by locality, and geographic region, by geographic region so that domestic and feral honeybees alike can intertwine in natural evolution? Further, the question must now be asked, when science becomes based upon an artificial system, out-of-tune with the natural environment, where does science stop and supposition/politics begin? Here one must remember, that if experimentation with various ways of measuring cells brought forth a new measurement system, and it was not correlated to go back and forth between the systems, and everyone wrote about comb cell size or referenced it from time to time during purported scientific study; and each study and generation began building upon one another; and because science is supposed to be exact, then what kind of science do we have concerning our USA and more importantly worldwide beekeeping community? How does one reference traditional history back to before the time of Pappus and Archimedes? You cannot take the math from one era and apply it to another to lend credibility if they both measure radically different, because you end up with different outcomes relative to the size of the honeybee and a major underlying causative effect bringing forth plagues of parasitic mites, secondary diseases, and field breeding variances in today’s world. It would seem we as an industry have forgotten basic traditional history and stopped teaching it, instead preferring to rely upon quick fix contaminating chemicals and negotiated politics, that are becoming an ever deeper and deeper chemical treadmill and political nightmare, to eventually send us all in the end into massive hive collapses, both locally and regionally. We cannot rely upon these quick fix gimmicks to solve our problems, for in truth, they have created them. The information is there to solve our disease and parasitic mite problems if we are willing to study and learn from the past so we can protect our joint futures as a beekeeping community. Isn’t it about time tradition was gone over again for our new generation of beekeepers to review and use; to make constructive decisions with, so they can manage honeybees to overcome today’s problems? The basic principles are simple. Basically it’s believing in a natural biologically controlled system to correct the situation without the use of essential oils, antibiotics, chemicals, artificial feed, and overuse of insemination by placing our domesticated honeybees back onto a beekeeping system compatible with that of Nature and her feral populations. The only catch is, going back to naturalist beekeeping, with a clean sustainable is hard labor-intensive field work and will take years to accomplish, but then it took years to create our current situation.